Mineral wool, best known by its trade name "Rock Wool", is similar to glass fiber insulation except the raw material is steel, copper, or lead slags or naturally occurring rock rather than glass. 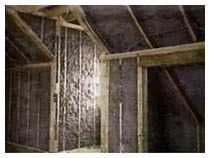 Rock wool's insulating ability is about 10 percent greater than that of fiberglass. Since mineral wools are made from rock or slag melted at temperatures over 219°F, the base material of batts or blowing wool is non-combustible. However, binders added to them may be flammable. Mineral wools can be irritating, therefore masks, gloves, long sleeves and other protective apparel should be worn when handling this type of insulation.